The most exciting feature of our Friendly Folks cartoons is their ability to be personalized. While we cannot change their clothes or aspects of the scenes, we can personalize them with your name and text, and we can add hair styles, children, pets, business and sports logos and more. Even with this, we understand that sometimes you just want a little more personalization, and we are here to please! Our desire to push the limits and diversify our customization options continues to grow as we get requests. Below you will find our readily-available personalization options, but rest assured, if you submit a request we will do our best to fulfill your wishes. 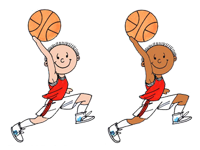 We offer light and skin tone options, as shown below. Skin tone color beyond our standard light and dark is available upon request/special order - contact us for additional information. However, unless you special order a skin tone color ($10 per item), we only offer light or dark skin tone, and all characters in the scene must have the same skin tone color. Please note that there are some variations in the background scene between our light and dark skin tones. This has been done to compliment the character and help keep focus on the character. 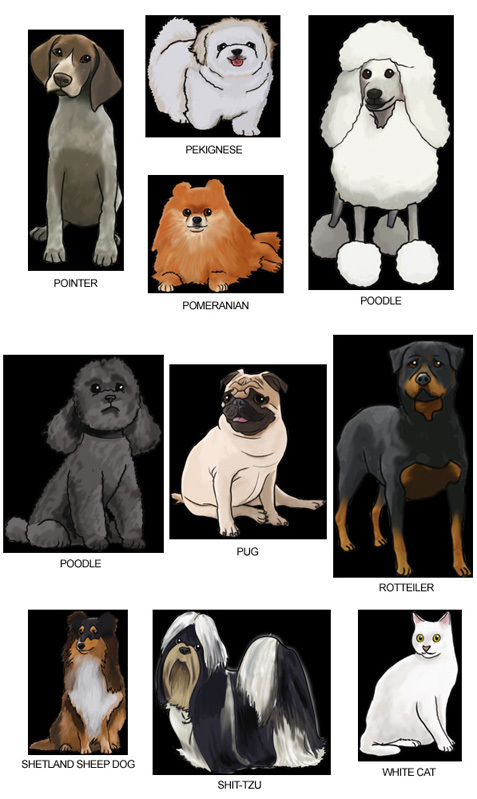 These differences are not present on all scenes, but there are some variations, as shown below. Aside from the original "stick figure" hair, that was once standard in the Friendly Folks line up, we offer one basic hair style option for our male and female characters, along with a bald option. The hair style for men is a standard, short male hair style, while the female hair style is a mid-length bob, which typically meshes well for characters with long or short hair. Currently these are the only hair styles that we offer. 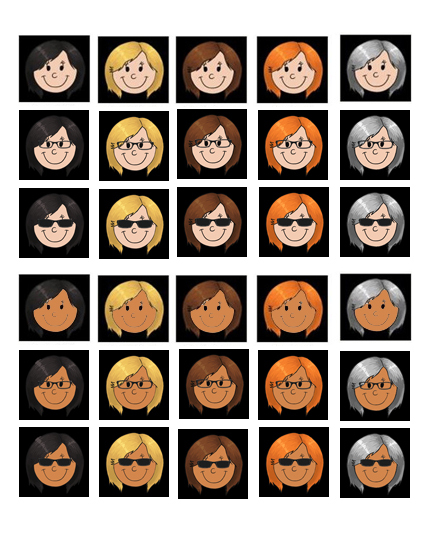 Most* characters can have a hair style added, in lieu of the standard "stick figure" hair. 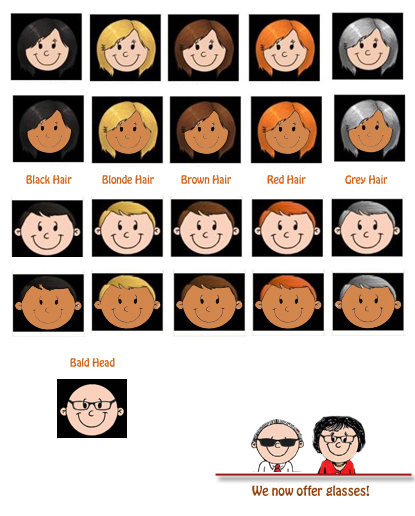 We offer brown, black, brown, blond, red, gray or bald, as shown below. 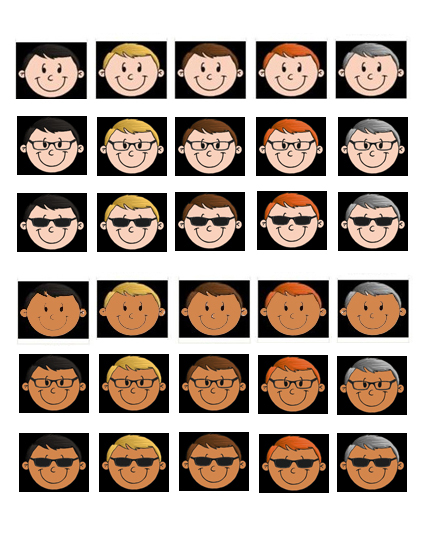 *IMPORTANT: We cannot change the hair style on any characters that have long hair, are wearing a hat, wearing glasses, have their head turned or are not looking straight forward. We can change the hair style on our child characters, as long as the exceptions noted above do not apply, but doing so will make them look much older. Please exercise caution when adding a hair style to a child character. We have recently added glasses to our line up! We can add clear or sun glasses to most* characters. *IMPORTANT: We cannot add glasses to any character that has their head turned or are not looking straight forward. Our Friendly Folks scenes are professionally drawn and ready for text. When you place your order we start with the cartoon scene only (no text anywhere). Therefore, the only text that will be on your cartoon scene is text that you specify. Most of our samples use "Deloise" font in the front, center box, where we normally add the person's name. However, depending on the scene and other personalization, sometimes we change this (and other) fonts. We have over 2,000 font choices available, along with a full palette of font colors. If you prefer that we use a specific font and/or color, please make a note in the "Special Instructions" field when you place your order. We want your order to be tailored to the point of perfection, so don't be shy - let your personality show through! And don't be afraid to provide lots of detail. If you find the perfect cartoon but something is missing - like your middle child, or you feel like the librarian cartoon is a bit too lackluster without little Jimmy and his friend Ben, do not despair! We have four child clip arts that can be added to your scene. As with our other personalization options, we are happy to add these extra characters at no charge. 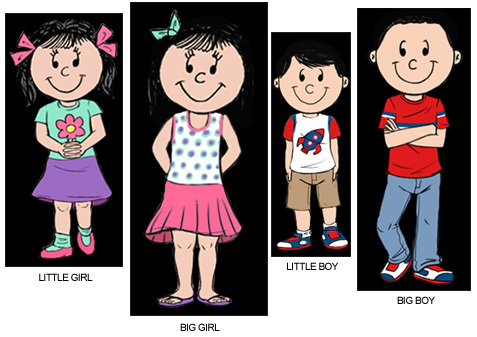 We have a little girl and adolescent/big girl, as well as a little boy and adolescent/big boy. It's easy to add one or more of these characters to your scene, simply mention it in the "Special Instructions" field when you order. But wait, that's not all! We can also add dogs and cats!! Yes, Fido and Slim, that well fed Labrador Retriever want to be included too! 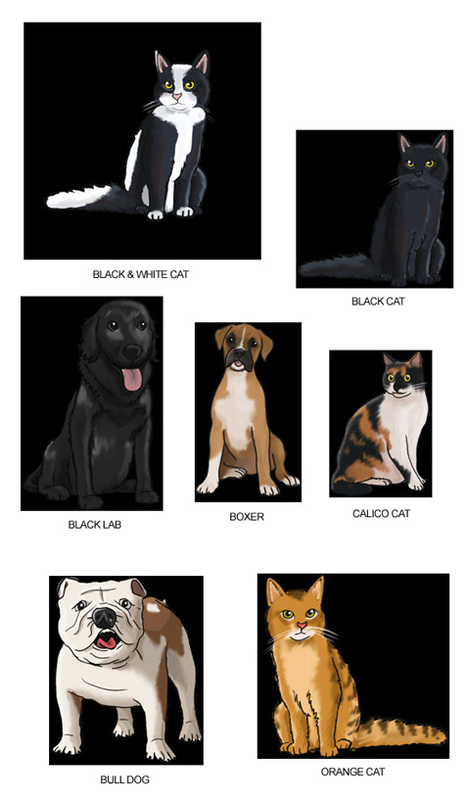 Below you will find the dogs and cats that we have available and ready to add to your scene. 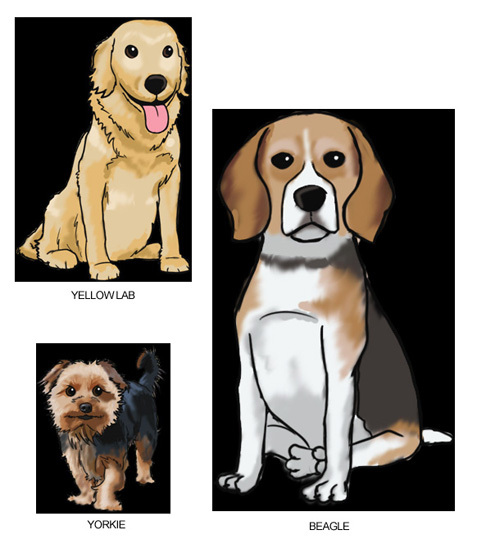 Please note that the majority of our animal clip art consists of purebred animals, though the art will work for mixed breeds as well - we won't ask any questions at all, so just find the image that looks closest to your adored pooch and tell us (in the "Special Instructions" box) which one it is. Upon request, we can add your business logo or other graphic to your Friendly Folks caricature scene! Simply make a note and paste a link to the graphic's location (on the web) in the "Special Instructions" field on your order. If the image is not on the web, just make a note in the "Special Instructions" field and reply to your order confirmation email with your image attached. If possible, we will size it down accordingly and include it on your scene, per your specifications. All major file formats are accepted. Please note that not all images will import properly, so we cannot guarantee that your logo or graphic can be added to your scene. It is presumed that you have authority to use any artwork submitted and thereby you are fully responsible for its use. There is no charge for adding your graphic. Yes! We offer discounted pricing for large orders. Please feel free to contact us if you need to place a large order, or are interested in selling our products for a fund raising event.